1) Comp. 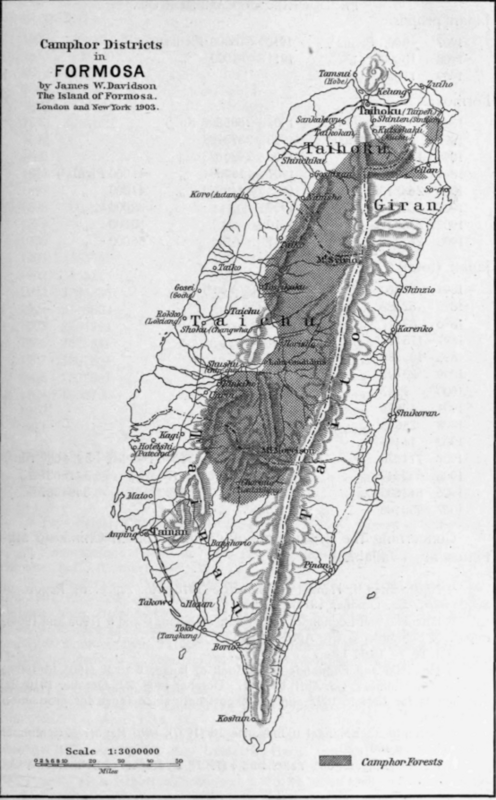 the accompanying map. Owing to the importance of both articles to the several branches of industry, the statistical material covering the production and export of camphor and camphor oil is considerable. However, there are contradictions between the official data supplied by the Japanese, who evidently have no desire to show their hand, and the reports of various European representatives (consuls and experts). In the following tables there will be found the principal data concerning production and export of both articles from the several districts of production. 1) Zeitschr. f. angew. Chem. 19 (1906), 261; Report of Schimmel & Co. April 1906, 13. 2) Nachrichten f. Handel u. Industrie 1910, Mo. 28; Report of Schimmel & Co. April 1910, 22. 3) Deutsches Hand. Arch. February 1911, 137; Report of Schimmel & Co. April 1911, 32. 4) Nachrichten f. Handel u. Industrie 1912, No. 73, 6; Report of Schimmel & Co. October 1912, 26. 5) Financial and Economic Year Book of Japan, 9 (1909); Report of Schimmel & Co. April 1912, 33. - 1 Picul = 100 Kin = 60,4 kg. <All 3 grades> (A, BB, B). 1) Financial and Economic Year Book of Japan, 6 (1906); Report of Schimmel & Co. April 1907, 17; Financial and Economic Year Book of Japan, 10 (1910). 2) Zeitschr. f. angew. Chem. 19 (1906), 261; Report of Schimmel & Co. April 1906, 13. 3) Board of Trade Journal 4. VI. 1908; Report of Schimmel & Co. October 1908, 31. 4) Diplomatic and Consular Reports No. 4768, August 1911; Report of Schimmel & Co. April 1912, 34. 5) Nachrichten f. Handel u. Industrie 1910, No. 28; Report of Schimmel & Co. April 1910, 22. 7) Deutsches Hand. Arch. February 1911, 137; Report of Schimmel & Co. April 1911, 32. 8) Oriental Physician and Druggist, Yokohama 1 (1907), No. 16; Report of Schimmel & Co. October 1907, 25. - Presumably the figures for 1904/1005 refer to exports. 9) Nachrichten f. Handel u. Industrie 1910, No. 75, p. 3; Report of Schimmel & Co. October 1910, 26. - 1 Haikwan Tael = (1907) 3,33 M, (1908) 2,74 M, (1909) 2,66 M, (1910) 2,76 M, (1911) 2,75 M.
Production Of Camphor Oil. Japan proper. Concerning the production of camphor oil in China no statistics are available. 1) Nachrichten f. Handel u. Industrie 1912, No. 73, p. 6; Report of Schimmel & Co. October 1912, 26. 2) Financial and Economic Year Book of Japan, 6 and 9 (1906 and 1909); Report of Schimmel & Co. April 1907, 17. 3) 1 To = 18,04 Liters. 4) Financial and Economic Year Book of Japan, 6 to 9 (1906 to 1909); Report of Schimmel & Co. April 1907, 17; October 1908, 29; October 1910, 24. The figures for 1894 to 1897 apply to export only since those for production are wanting. 5) Berichte fiber Handel u. Industrie 10 (1907), 605; Report of Schimmel & Co. October 1907, 20. 6) Deutsche Japan-Post, Yokohama 5 (1907), 8; Report of Schimmel & Co. April 1907, 22. 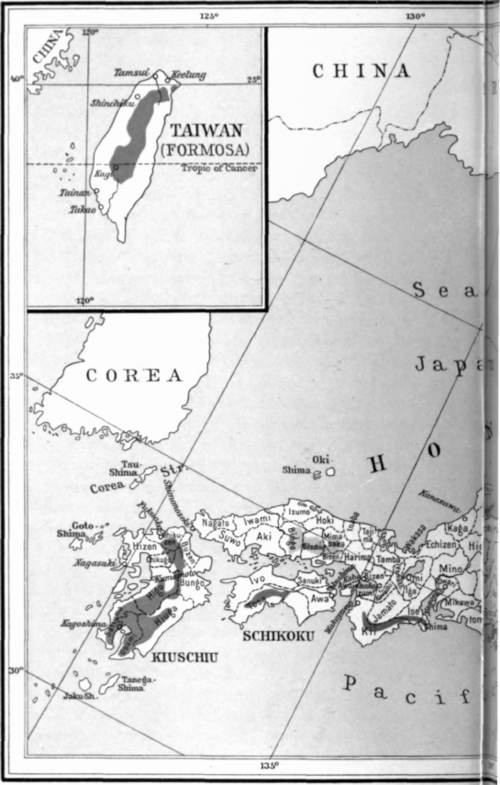 Formosa. Export to japan and foreign countries. 1) Toyo Keisai; Chemist and Druggist 73 (1908), 560; Report of Schimmel & Co. October 1908, 32. 2) Financial and Economic Year Book of Japan, 8 (1908); Report of Schimmel & Co. October 1908, 30. 3) Deutsche Japan-Post, Yokohama, 5 (1907), 8; Report of Schimmel & Co. April 1907, 22. - Berichte uber Handel u. Industrie 10 (1907), 605; Report of Schimmel & Co. October 1907, 22. - Nachrichten f. Handel u. Industrie 1909, No. 46, p. 3; Report of Schimmel & Co. October 1909, 30. - Financial and Economic Year Book of Japan, 9 (1909); Report of Schimmel &Co. October 1910,25. - Deutsches Hand. Arch., February 1911; Report of Schimmel & Co. April 1911,32. 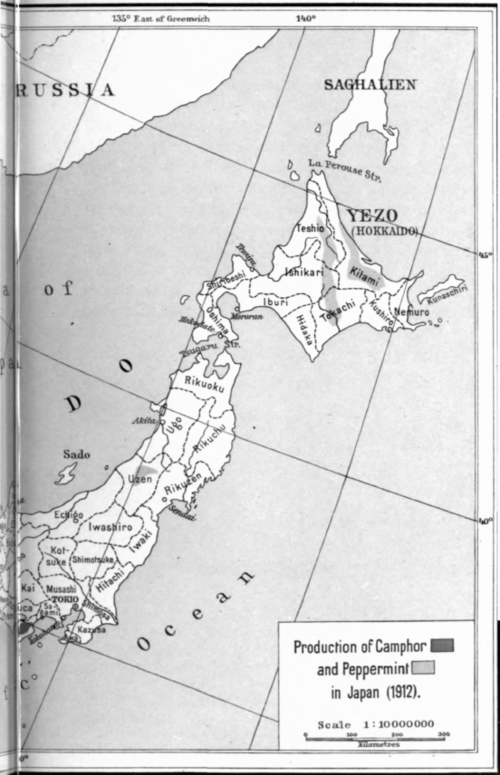 5) Financial and Economic Year Book of Japan 11 (1911); Report of Schimmel & Co. April 1912, 34. 6) Financial and Economic Year Book of Japan 6 (1906); Report of Schimmel & Co. April 1907, 17. - Deutsches Hand. Arch. Jan. 1907, Part II, 35; Report of Schimmel & Co. April 1907, 17. - Nachrichten f. Handel u. Industrie 1909, No. 46, p. 3; Report of Schimmel & Co. October 1909, 30. Exports of crude camphor from Formosa3). 1) Diplomatic and Consular Reports No. 4768 and 4769, August 1911; Report of Schimmel & Co. October 1911, 25. 2) Diplomatic and Consular Reports No. 4996, September 1912. - Of the exports of 1911 by far the largest part, viz., 2374666 lbs., was shipped to Germany.